What Day Of The Week Was January 30? 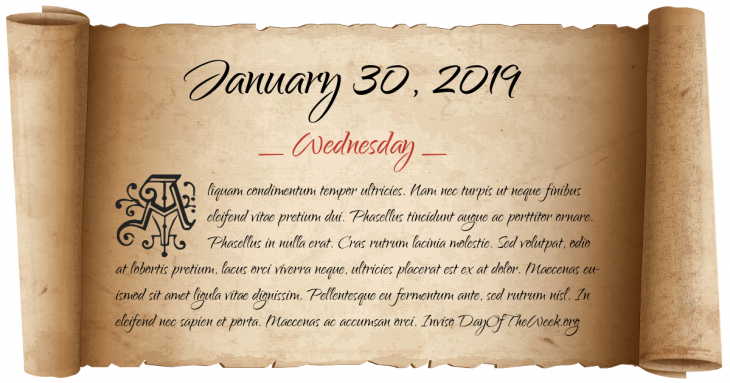 January 30, 2019 was the 30th day of the year 2019 in the Gregorian calendar. There were 335 days remaining until the end of the year. The day of the week was Wednesday. Oliver Cromwell, Lord Protector of the Commonwealth of England is ritually executed two years after his death, on the anniversary of the execution of the monarch he himself deposed. The first boat specializing as a lifeboat is tested on the River Tyne. Edward Bransfield sights the Trinity Peninsula and claims the discovery of Antarctica. In the first assassination attempt against a President of the United States, Richard Lawrence attempts to shoot president Andrew Jackson, but fails and is subdued by a crowd, including several congressmen. New Year’s Day in Chinese calendar. Start of the year of the Metal Pig in Chinese astrology. Indian pacifist and leader Mohandas Karamchand Gandhi known for his non-violent freedom struggle is assassinated by Pandit Nathuram Godse, a Hindu extremist. Bloody Sunday: British Paratroopers kill fourteen unarmed civil rights/anti internment marchers in Northern Ireland. Who were born on January 30?